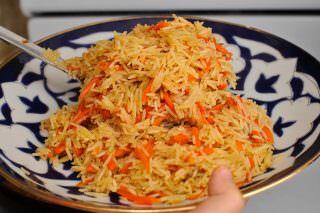 There are many recipes of Uzbek Palov on the Internet. 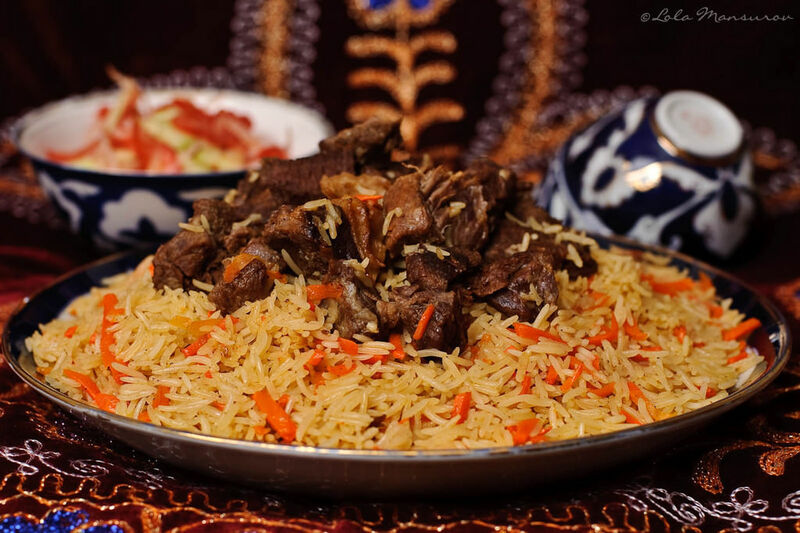 Palov is a traditional Uzbek main course food. If you ever visit Uzbekistan this is probably the most common food you will encounter. 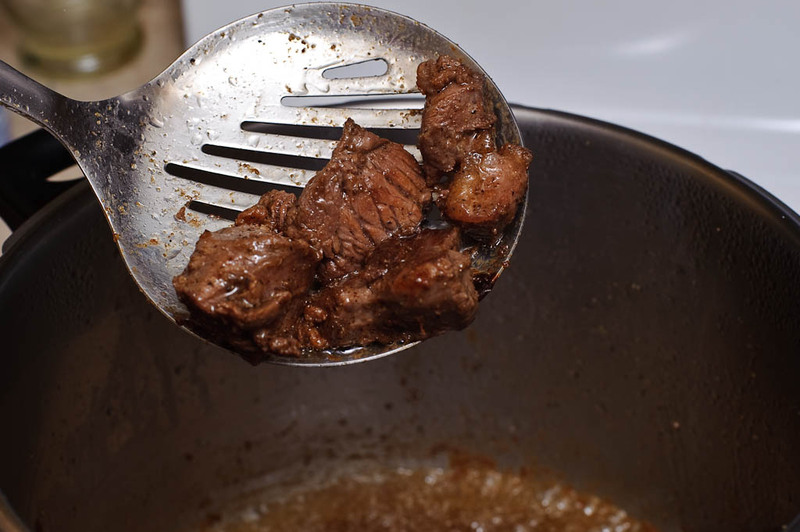 But one thing you will not find in Uzbekistan is Palov made in a pressure cooker :) This is the method I learned in U.S.
Uzbek Palov as we know has many ingredients. If you do not see those ingredients in my recipe, do not jump into a conclusion that this is not the real deal. Let’s not forget that every region in Uzbekistan has it’s own version of Palov. Except for basic ingredients I believe that every recipe should be altered according to your taste. If you do not like certain ingredients, you should always feel comfortable to either swap them or omit them without feeling any pressure. Personally, I do not like raisins, barberries or eggs in my Palov. Chickpeas are a different story, but our family likes the chickpeas in a different dish called “Nohat sho’rak“, which I will post a recipe for sometime later. Just in case, I added chickpeas to this recipe. Rice is the most important part of any Palov. Living abroad creates its own difficulties in finding the right and essential ingredients for any ethnic kitchen. I have used many different rice brands and types in my cooking endeavors. Every time I cook, I rely on my family’s feedback about each meal. If they really like it we stick with it. If they do not like it, we try something else. After much trial and error I now use separate types of rice for Palov and a different type of rice for all other rice-including meals. RICE I am currently using Saleem Caravan, Super Golden Basmati rice. Product of India. It can be found in many international markets. We buy it from a local Turkish store. Rice is naturally delicious, with complex carbohydrate and low glycemic index. Basmati Rice is finest rice, produced in Some Parts of Pakistan and India. The main Characteristic of Basmati rice are, that it is Long Grain, Non-Glutinous, Slender ,very Aromatic and excellent in cooking and taste. It has been cultivated for many centuries in hot and humid climate of Punjab along the rivers Ravi, Jhelum, and Chenab in Pakistan. The word Basmati come from Panjabi language meaning “smell of soil”, so soil where it cultivated plays a huge role in Basmati finest Characteristics. Pakistan Produces two Verities of Basmati : Supper Kernel Basmati and PK 385 Basmati .These both varieties are pure 100% Basmati Rice, These varieties are the basic or building block for other modified basmati rice being sold in the international market under basmati name. 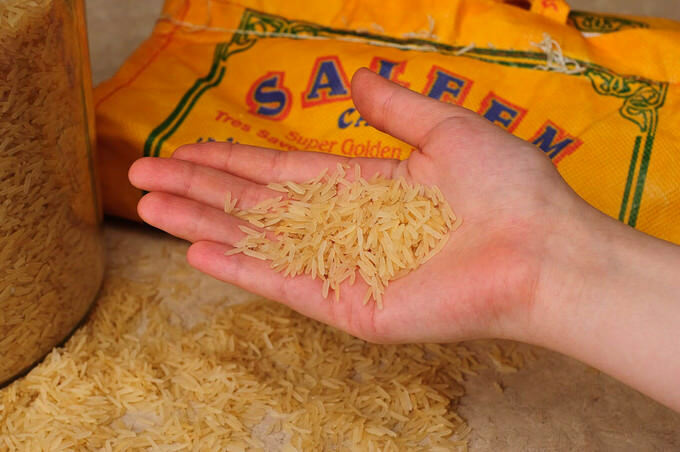 We at “Saleem Caravan” Put every effort possible in place to maintain the purity and try to preserve the finest characteristics of BASMATI RICE. I must say, I really find this Saleem Basmati rice delicious and well suitable for making Palov. It doesn’t have the heavy smell that most Basmati rices have. If for any reason you cannot find this rice, try “Jasmine” rice or any other Basmati rice from middle eastern markets. Some of the rices I tried from local grocery stores were Japanese rice “Botan”, Italian rice “Arborio” and Turkish rice “Baldo”. These are the closest I could get to our Uzbek rice. I use “Botan” and “Baldo” for other dishes now. “Arborio” did make a very good palov but it was awfully expensive compared to other rice types. 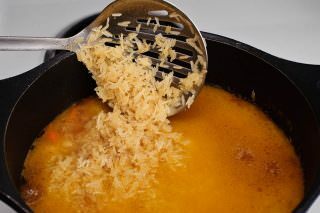 Plus, if you would like to use “Botan”, “Arborio” and “Baldo”, you should previously soak the rice in warm water (at least for half an hour) to get some of the starch out as they are very rich in starch. Water intake of every rice is different. 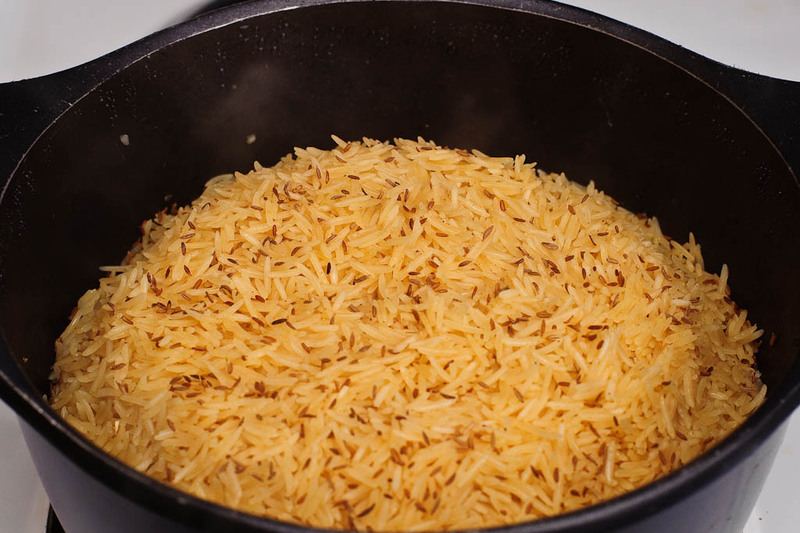 Most likely all Basmati rice types will use the same amount of water in Plov but it might vary for other rices. To be on the safe side with other types of rice, make sure that the water level is at least 1 inch above the rice level. CARROTS: The Tashkent version of Palov calls for yellow carrots. Aside from not being able to find yellow carrots where we live, my husband much prefers orange carrots. But if you can find yellow carrots, go ahead and try to use those. They take a little longer to cook than their other counterparts though. PRESSURE COOKER: Any pressure cooker can be used for this recipe. Knowing your pressure cooker will help you a lot here. Not all pressure cookers use the same amount of time to have desirable results. I will give you approximate numbers for most pressure cookers. 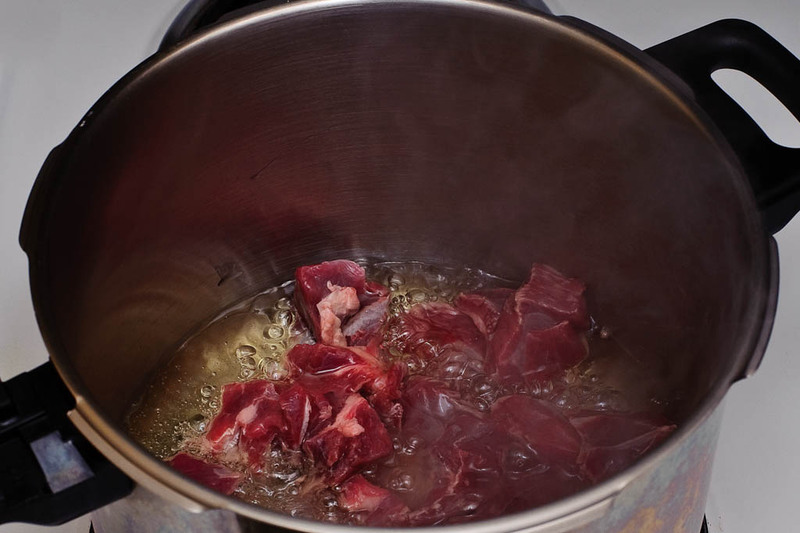 What I like about pressure cookers is that they cook any meat to tender perfection. I still choose lamb over any other meat type for Palov, but if you wish to use beef or chicken, the results should not be disappointing. The only difference is, every meat type will have its own cooking time. CHICKPEAS: If you are using them in your Palov, soak 0.5 cup of chickpeas in 2 cups of lukewarm water for 5 hours. If you wish, you can leave them overnight and use first thing in the morning. GARLIC: I didn’t add garlic to this recipe but if you wish to use garlic, you need to get a whole garlic bulb. Wash it well, cut little imperfections without hurting the texture of the bulb. You can even peal off some of the outer layers to make it easier for moisture to get through. note: you can click on the below images for a larger size photo. 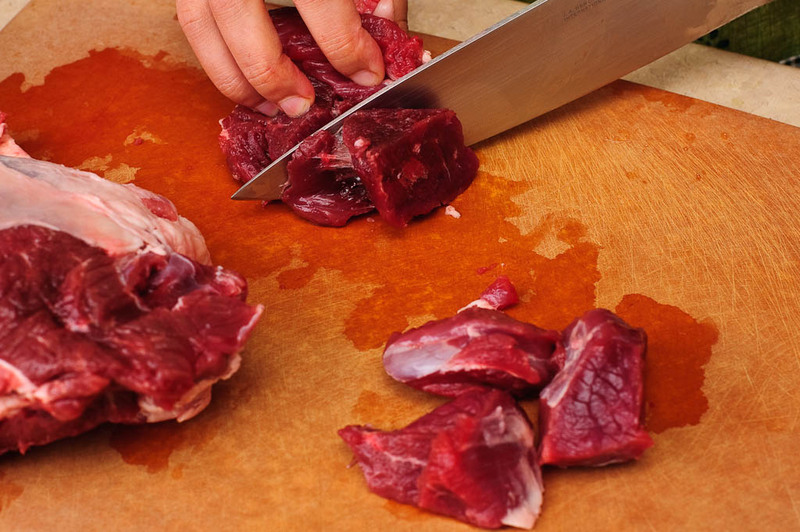 Cut the meat into 2×2″ cubes. Slice the onions in 1/4″ half circles. 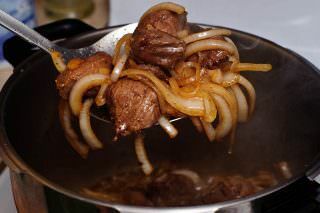 Once the meat and onions are ready, heat the pressure cooker on medium high heat + heat the oil and start frying the meat. Add salt, ground cumin and black pepper. 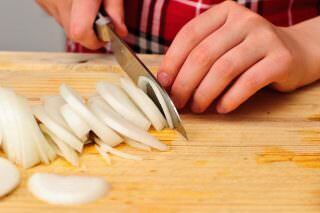 Fry until slightly brown on all sides and add onions. 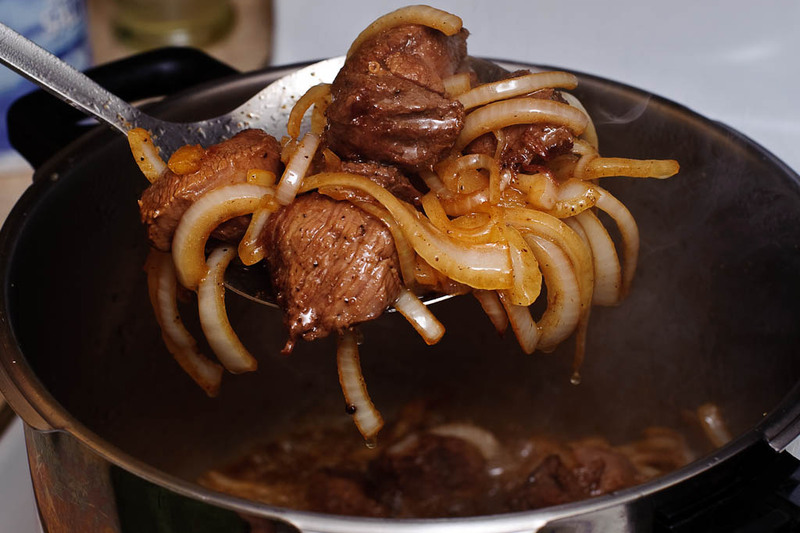 Fry onions along with the meat until onions are soft and golden brown. Add all the water, mix it and close the lid of the pressure cooker. Cook on medium-high heat for about 15-20 minutes. 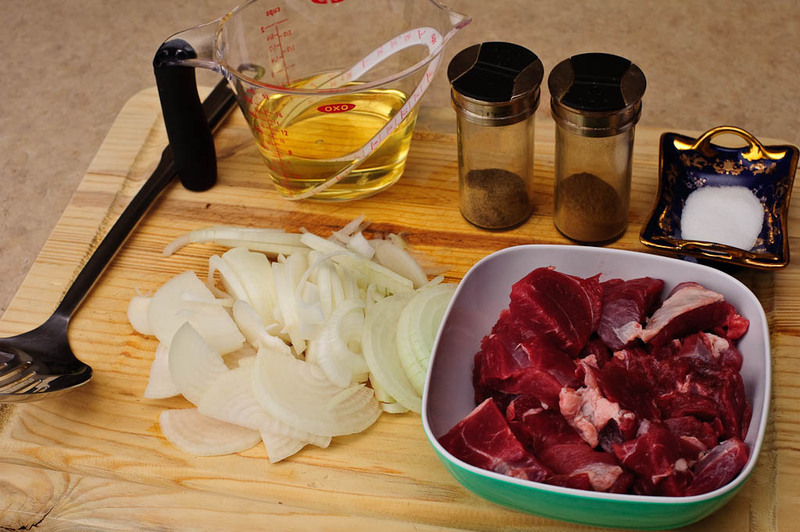 If you are using beef then you should give it a good 30 minutes to cook well. 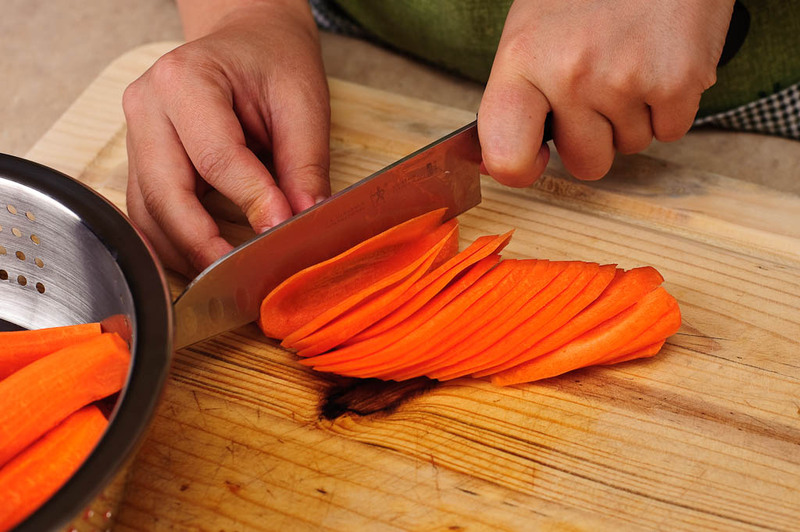 Meanwhile prepare the carrots for the next step. 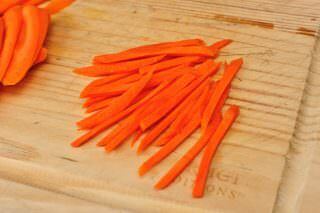 Clean, wash and julienne carrots like in the above pictures. Once the time is up for the pressure cooker, open and empty it to another large nonstick pot (or Kazan) and put the pot back on the stove (medium heat). There will be no need to wait for the water to boil, since it is going to be pretty boiled up in the pressure cooker :) Place the carrots evenly on top of the meat and onions, but do not mix anything. Leave the pot like this for 15 minutes on medium heat. Note: if you are using chickpeas and garlic, this is the time to include them. Rinse the chickpeas that were previously soaked in water and distribute them over the carrots. Drop the garlic. Usually garlic is removed once rice is added and just left on top of the dome you will be creating out of the half-cooked rice. I would suggest to leave the garlic on top of the carrots until the Palov is ready. Wash the rice well at least 2-3 times. 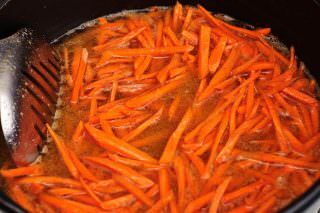 Drain the water and using a spatula place the rice over the carrots evenly. The water that was initially added into the pressure cooker should be enough for the whole process. But if the water does not cover the rice (1 inch above) feel free to add a little more water. All Uzbek recipes let the water evaporate with the lid open. It takes awful a lot of time and I do not find it necessary. Close the lid of the pot and in medium-high heat let it stand for 10 minutes or until the rice absorbs the water. Check every 2 minutes, because you do not want the bottom of the Palov burnt. In about 8 minutes, flip the top layer of the rice to keep the rice evenly moist. Once the water is absorbed, make a dome of rice and sprinkle whole cumin on top. Lower the heat to 2 (low), close the lid again and keep it that way for another 10 minutes. In 10 minutes remove the lid and try the rice. If it is well-cooked, then mix the ingredients well. Not that fast! :) If you used garlic, this is the time to excavate it. Some people also like to take the meat out, cut it in smaller pieces and put on top of the Palov. So, mix the content of the Palov together well. If the rice feels a little undercooked, do not hesitate, sprinkle some water and close the lid again for 5 minutes (or the desired amount). Serve it in a Lagan (traditional Central Asian large plate) and put meat and garlic in the middle. Garlic comes out easily. It is should be well-cooked and delicious. Serve with fresh vegetables or a spring salad, pickled tomatoes and pickles cucumbers. Rahmat, erinmasdan tushuntirganiz uchun. Chiroyli chiqibdi. Manam anu kuni qiziqb olganidim pressureni o’rtachasidan (2 lb osh damlasa bo’ladi.) To’g’risini etganda qozondan yaxshi ekan. (Uzb.dan kelgan qozonda ovqat qilishdan qo’rqib qolganman :) ) Oldin osh qilsam tegiga oldirib yuborardim, keyin umuman qilgim kelmasdi. Xozir shu pressureda 3-4 marta osh qilib bir marta ham muammoga yo’liqimadim. Pressure cooker hammada ham yo’q. Oddiy qozonda, konservativ usulini ham yozbering. Resept so’raganlarga saytizni refer qivorardik keyin. Uzbek milliy ovkatlaridan biri bulmish Palov hakida sozlab utganingiz uchun va uni tayorlash uslublarini batafsil yozib utganingiz uchun sizga kattakon rahmat. Yukorida aytib utilgan narsalarning hammasiga kushilaman. Yana bir ma'lumot, Safeway supermarketida Mahatma Parboiled Rice sotiladi, bu guruch kurinishi va hajmi yuzasidan Uzbek devzira guruchga ham uhshab ketadi. Bu guruchda tayorlangan taom (Palov) juda ma'nili buladi. Bir sinab kuringlar. Qudrat aka katta rahmat sizga. Sizdan yaxshi osh qiladigan yana bir kishi bor o’zi, dadamlar :) Siz ham plaov receptingizni qo’ysangiz juda zo’r bo’lardi. Guruch haqidagi ma’lumotingizni yuqoriga qo’shib qo’ysam bo’ladimi? I hope to make this at home. This dish brings back fond memories of my time spent in Central Asia (Tashkent region of Uzbek. & in Kyrgyzstan). My wife is planning to make the Palov in the coming week. All ingredients are easy to find here in Switzerland. I learned about Uzbek (& Central Asia) hospitality where even after a short 10 min. visit, we were offered to stay for a meal. I was getting 5+ meals/day … Palov at 11pm! Here are some photos from my recent trip to Tashkent area (& Central Asia). I was able to get some nice panoramic photos taken from Tashkent’s tall “needle” tower overlooking the city at sunset. Tim, you have some killer photos on your Flickr page and on your website! I loved your portraits, landscape and architectural work! You should visit Samarkand, Bukhara, Khiva and other historic places when you visit Uzbekistan next time. Truly superb photo opportunities there! Thanks again for visiting us here! hiya, thanks for detailed explanation, i wanted my wife (she’s american) to cook plov for me and tried to explain but was not really good at that. And now with this site’s help I hope she will do easily and as yummy as yours. Please extend my regards to your wife. Hilola, thank you for the recipe. Hozir hamma masalikklarni tayorlab, receptni Yahshilab!!! tushunish uchun kirdim. Bir okigandim, no tugrisi korkdim-u bu kichkina lekin muhim detali esdan chikib kogan busachi deb. Cross the fingers, I am about to make my first pressure cooker plov. Jamilka, sorry honey uyda yo’q edik, vaqtida commentingizga javob yozolmadim. Let me know how it turned out! EEEEE, zur chikdi. Forumga rasmini koyaman deganidim, sizga refference koyib, blin, karasam uje rasm koyadigan opciyasi yok ekan forumni yangi korinishida. Ili men prosto tushunomayapman!! I eshe, Katta rahmat. Za vse, i za etot recept i za ostalnie toje. We are Afghans about more than 2000 families living in Guelph Ontario we couldn’t find any kind of good rice to eat finally we have found a rice called Uniqu Basmati rice it was really top rice in the world if you guys wants to cook Qabely Palaow, Chalaow or some thing else please have a try once from Unique basmati rice it is really good . If we can find the type of rice you are suggesting, we are absolutely going to try it out. Thank you for the suggestion. Oh guys Saleem Caravan rice is nothing please have try to Unique Basmati rice it is really top rice in canada. Last Sunday was the day for the third recipe of yours. 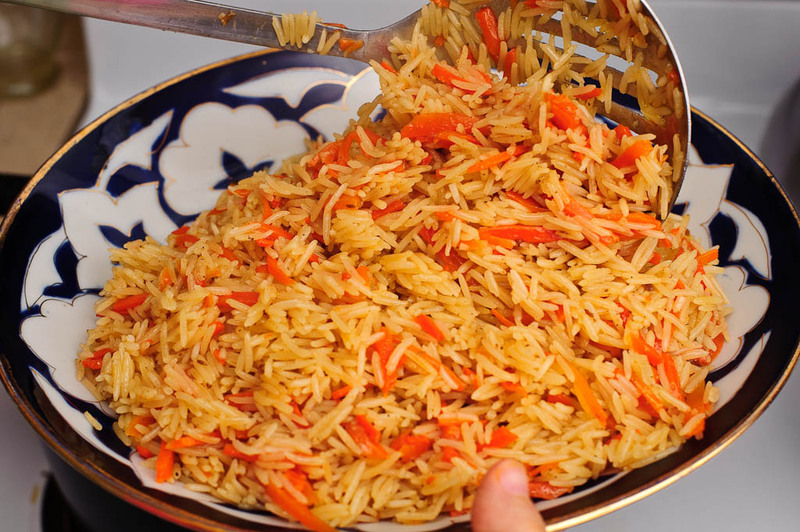 I made the uzbek plov recipe following your detailed instructions and your amazing photographs. It was so good and it was exactly as it appears in your pictures. (I used chickpeas and garlic).The only difference was that I used olive oil as, here in Greece, we have plenty of it and, because I could not find the kind of rice of your recipe, I used parboiled rice. Even so, it was tasteful and we liked it very much. I plan to cook as many of your recipes as I can and I will inform you every time about the results. Thank you. Please let me know if you need help or suggestions here and there. I will try to answer your questions promptly. Assalomu alaykum! Menining ismim Mohina. Man Toshkentdanman. Ingliz tilida Uzbek foods qidirib yurgandim. Sizning saytingiz orqali batafsil ma’lumotga + rasmlari bilan ega bo’ldim. Gap yo’q. Kooottakon RAHMAT! Many thanks for this yummy recipe. Tried it this weekend and it came up nice. My wife visited Tashkent when she was very young and she always talks about the food she had there. She liked this rice dish very much. One thing I messed up during the preparation. I used lamb neck for this dish. I put all my lamb in one go when browning, so instead of browing they started to get cooked. Next time I will properly brown the meat and onion. 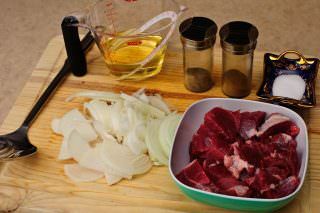 To cut the amount of fat I will try something next time.. Do the part with pressure cooker, so the lamb is done. Leave it overnight. 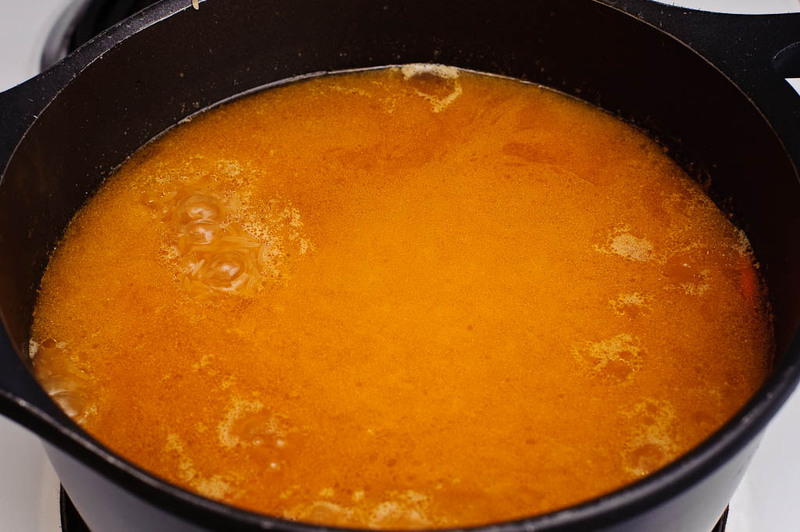 The broth/gravy will have a whitish layer of fat on the top (like one you get in broth)). Remove the fatty layer. Boil the broth and start with the carrot. This way I may loose some of the flavour but will reduce the fat a lot. Lola, fantastic photography and recipes! Eager to try them all! – the whole garlic bulb- Is this peeled after washing, and if so how? – flipping the rice- can you please explain? My father always taught me never to give it another stir after the initial one. – making a dome- how is this done? and our of curiosity, why is this done? – last question (i promise! )- what exactly do you do with the garlic at the end? Thank you for inspiring me to venture into the kitchen! Anyway, just thought I’d let you know, in case you didn’t know already (I just found it odd that your copyright was removed and no mention or credit given to you). Great tutorial. Clear explanations and great pictures. I was lucky enough to have an Uzbek flatmate who used to cook this for us. Loved this dish. We called it “heart attack on a plate” and always had to have more. Off to buy ingredients now. Hi, I am using the pressure cooker technique for this recipe next Saturday. My cooker is a 10 liter/quart. I did not find the Saleem Caravan, but the shopkeeper recommended Falak Basmati. I belong to a culinary historian club (Southern California) and the subject is Uzbek Cuisine. The recipe he provided calls for barberries (zereshk). I will share how the dish turns out. Dear Sheila, I am very sorry for I am getting back to you rather late. How did it turn out? 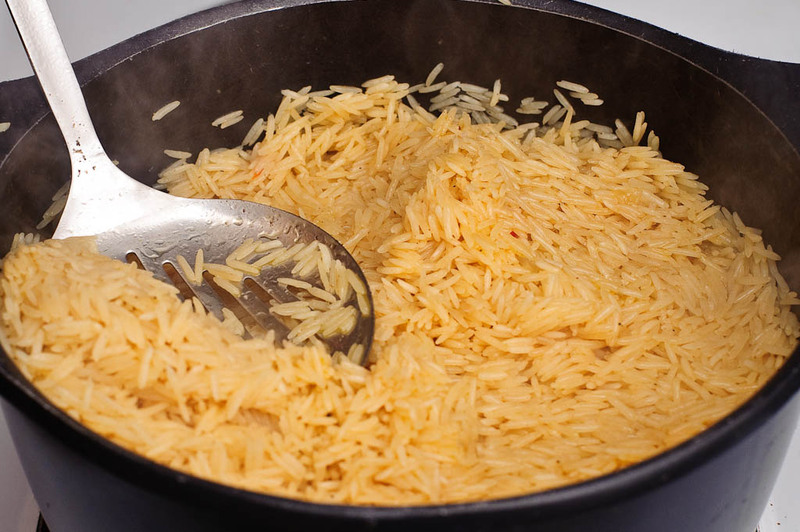 The biggest difference between most basmati rice is the taste and the odor they produce while cooking. While the end result is almost the same (as basmati rice does well with water and absorbs as much as you can throw at it) it is strictly personal issue if you wish to go with one or the other. Let me know how it turned out! wow, finally I have found receipe I can understand. I have been in Soviet army and chefs from Uzbekistan used to make it. It was just amazing. I have been travelling later on in Asia, even celebrated my birthday once in Tashkent, I remember how every evening there was huge boils on the street and best plov I ever tasted. Will try this make now. I am going to try this recipe. I am not familiar with Uzbek food, but I use my pressure cooker a lot. I think you do not need to soak the chickpeas ahead of time since you are using a pressure cooker. I never soak any beans at all. 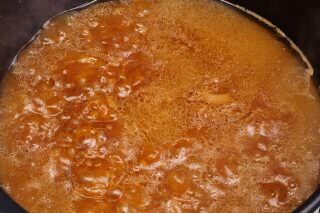 I always found that about 20 minute in pressure cooker for dry beans result in best texture. No soaking and planning hours ahead and no mushy beans. This is what I do with all kind of beans. Thank you for the recipe! Would you please let me know if I can buy the rice you mentioned online? i have searched it myself to no avail. I miss my Kyrgyz friends. I would have loved to have learned more of the local culture. Fortunately I still have friendships with some that have moved to the United States.